Charred Peppers Salad, Southern Italian Style. I'd not change any place in the world with Naples (and its immediate surroundings) when it comes to pizza. Pizza, as we know it today, was born there and Naples is, not surprisingly, most likely to be the city with the highest density of Pizzerias on Earth. Admittedly, not all the pizza made in Naples is great, but there are a pretty impressive number of pizzeria who produce a great pizza. Yet, when someone who is a real experts tells you he has found the best pizza in Naples, you simply strive to make it there and see what the fuss is all about, even if you live more than 1000 km away. If you have been reading this blog from the start you might remember Marco, also known as Pizza Napoletana on a number of food discussion forums, and the pizza pics of his I published. A few month's ago he gave out his list of favourites in Naples and was clearly quite excited for the (re-)opening of one particular pizzeria, the best of all according to his opinion: Da Salvo in San Giorgio a Cremano (just outside Naples). Whenever I handle the ingredients I am planning to use for my next meal, I cannot help think that there is a part of us that is still back in the Stone Age. Fact is, as much as I love quality ingredients, there is nothing that compares to the joy of using ingredients that you have grown, caught or prepared from scratch yourself. I definitely have quite a bit of that old hunter-gatherer ancestor in me. My balcony is hardly a place where you can sit out and enjoy the summer sun: too many herbs and potted plants (quite a few used for cooking) there screening you from those precious rays. Likewise, when I walk into a wood I try as hard as I can to just enjoy the landscape, yet inevitably I find myself looking for mushrooms, berries and wild herbs. At the seaside, I look for molluscs, which, on the shores of Lazio, means telline. 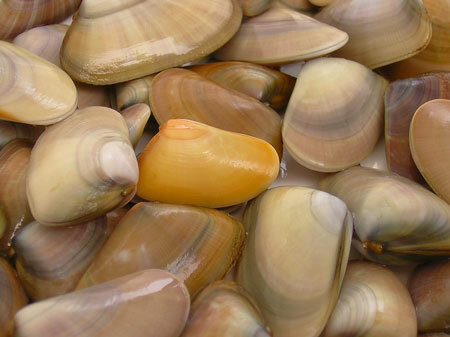 Telline (Donax trunculus), also called arselle in Italian and wedge shells in English, are small triangular clams that live in the sand banks close to the shore. Commercially, these are fished by boats carrying nets that drag through kilometres of the superficial layer of the sand banks, something that, to my eyes, is pretty damaging from the ecological point of view. Yet the real way to collect – and earn – a well deserved dish of telline is fishing them yourself. 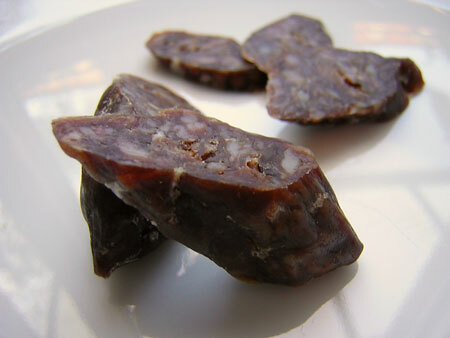 From time to time I get e-mails from Americans (and I mean Argentineans as well as US Americans) asking for some particular Italian recipe their grandmother used to make. I am happy to help whenever I can, I love those trips down memory lane, but occasionally I feel terribly sorry for not being able to lend my hand in their recipe search. Sometimes it is because, while I know the dish well, I have no idea of how the recipe looks like. Yet more often, I simply have no idea what dish they are talking about: the name might be familiar, but the description of the dish is not. The problem is that Italy simply does not have a national cuisine, but rather a collection of local ones that at times can change dramatically just going over the next hill. So, even for a born and raised Italian like me,m Italy remains an immense cooking school, with a promise of something new around the next road bend. Shortly before leaving for my Italian break, I had one of these ah-ah!/I am learning something new moments. I was reading William Black's "Al Dente ", a very well written and enjoyable book about Italian food and history, and stumbled upon his description of Tiella Gaetana, the stuffed "bread" typical of Gaeta . 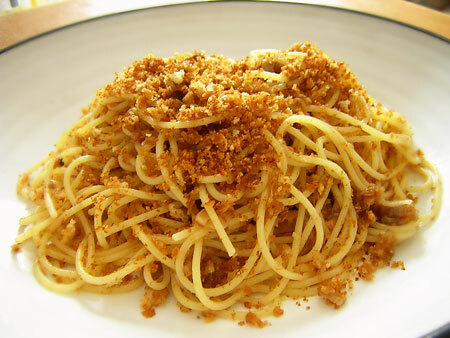 Now, I spent many of my childhood summer holidays in the area near Gaeta, so I had heard the name before, but I must admit I had no idea what the dish was. Black describes food in such a delicious way – something he definitely has a knack for – that I knew I had to get a bite of tiella as soon as I could. I also wanted to learn more about it. Back when Italy still was divided into a number of Kingdoms – i.e. till the second half of the XIXth century – Gaeta marked the border between the Kingdom of the two Sicilies (aka Kingdom of Naples) and the Papal state. For centuries Gaeta was an important military port as the remaining fortifications still show today. Today the city lives more of commerce and tourism than warfare, and the wealth and size of the city have benefited from that. Leaving behind the historical chatter, for those into food Gaeta has three intriguing items on offer: olive (olives) di Gaeta, tiella Gaetana (a savory stuffed flatbread) and the weekly market. Leaving the former two for upcoming posts, I'll show you around the market. 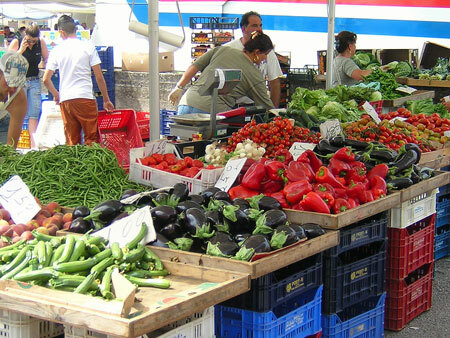 The city's market takes place every Wednesday not far from the railway station of Gaeta(there are a number of entry points, so it is best to just ask the locals). It is pretty much divided into a part dedicated to food and one to almost anything else with goods ranging from shoes and cheap clothes to kitsch home decorations and cheap plastic toys for kids. You can guess which part I was interested in. Among the many "salumeria" stalls – selling, as customary in Italy, cured meats and cheeses, but also milk, bread and eggs – one particularly caught my eye. Beside the standard cheese selection, they had a selection of farmhouse goat and sheep cheeses. In any big city market these would have been presented in a specially attractive set-up, advertised with great clamour and sold at dear prices. 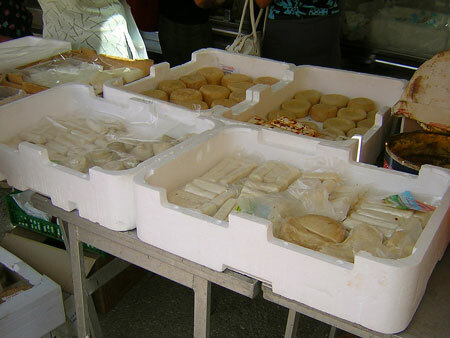 As often in Italy, qualityis taken as obvious, so here the cheeses simply come in polystyrene boxes straight from the producer and are sold at dirt-cheap prices: the small goat cheese went for 1 Euro each, with the pecorini only slightly more expensive. I couldn't resist the temptation and a couple of goat cheeses and a small young pecorino. I am just back from my short Italian break, which has been full of relaxing days spent at the beach, nice food and the occasional Italy football match on TV. My notebook and digital camera have captured the best food moments of the past week and, day after day, the essence of those scraps and shots will appear here. To start, I picked one of the simplest dishes I made in the past week, yet one which perfectly sums up the essence of Italian summer: charred pepper salad. 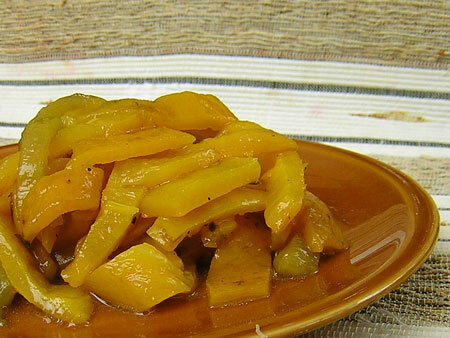 While you can use any peppers you like for this dish, getting some sun-ripened peppers in season is the best you could wish for. If you cannot find those, supermarket ones will do, but absolutely avoid pre-packaged peppers stored under modified atmosphere: I find these have a peculiar stench that will not go away no matter which cooking technique or how much seasoning you use. I had some delicious giant yellow bell peppers at hand, each shaped slightly differently from the next, which worked like a charm. It would be impossible to find peppers like these in a supermarket: too irregular for the modern city customer, which says loads on the consumer misinformation we are exposed to. Luckily, Italian markets have not succumbed to this idiotic mentality. Our small but cosy seaside home was quite near to the town of Fondi, with its medieval city centre and its rather famous produce market, the MOF. This huge market, probably the largest in Southern Italy, is mainly for greengrocers and purveyors but it opens to the public after 11 AM. It is not a place for everyday shopping: everything is sold by the case. Still, if you're planning on spending a week or more in the area (or if you live here) and want to do some cooking, it is a great place to buy good quality ingredients at prices that range between one third and half of what you would find in stores just a few kilometres meters away. We did some shopping here at the very beginning of our holiday bringing back a few kilos of Sicilian round aubergines, zucchini, cherries and clearly some huge misshapen yellow bell peppers I used for this recipe. Curiosity is one of the things that most food lovers, and definitely most food bloggers, share. We're always looking for the next undiscovered restaurant, ingredient or dish that crosses our way, in the hope of feeling a new mind blowing emotion to enrich our knowledge. For the bloggers among us, the desire to find a new story to tell adds an extra dimension to the search for novelties. Today restaurants tempt us with an array of unusual and exotic ingredients, and even the plain old meat course has acquired a number of new entries that are muscling their way through the beef, pork, lamb and game classics. Ostrich and kangaroo, or for the faint hearted Australus, have been around for over two decades (in European restaurants, that is). Crocodile seems to be becoming popular, at least with farmers breeding them. Bison is quickly gaining a gourmet street cred, with places like Alinea in Chicago using this meat successfully, as it seems. In Italy there is an old tradition of alternative meats like donkey and horse, while European water buffalo is slowly carving a small market niche for itself. Yet, the real red-hot new meat back home seems to be European Mouflon. 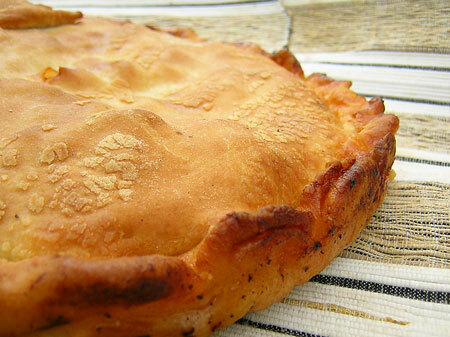 This animal has been on the diet of the people of its native Sardinia for ages, but a bit of good old press put it onto the radar of gourmets. About three years ago Davide Paolini, the gastronomical critic of the financial newspaper Il Sole 24 Ore, wrote an article about Mouflon meat cooked by chef Fulvio Pierangelini – chef-owner of Il Gambero Rosso in San Vincenzo, Tuscany, considered by some of Italy's finest food journos as the best chef back home –which sparked some interests in pro-cooks and food lovers. Mouflon remains a bit of a rarity though: although a near relative of sheep, it is anything but docile and it must be reared in a state of semi-liberty, needing great spaces to roam free. For this reason it has remained an elusive ingredient even on the table of the best restaurants. Fabulous Favourites Festival (IMBB? 26 and WBW 21): Pizza and Wine? For ages I had been reading and hearing about how it is impossible to find a real wine-food pairing that works with pizza. Not every expert agrees with that, some even coming up with extensive pizza-wine pairing lists,but could it really be true? Does my favourite food taste better without wine than with, an heresy for any food-loving Italian? The joint WBW/IMBB Fabulous Favourites Festival was just screaming for me to pick up the chance and do some food-wine pairing experimenting. Want to know what came out? Continue below! As much as I love bread, I hate wasting it. In part it must have to do for my passion for it, but I rather believe that my maternal grandparents are to blame (or praise, depending on your point of view). Having lived through WWII and food rationing, they had a careful attitude to food waste, yet not guilt-ridden like the grandparents of a few school friends I got to know better during my childhood. If you exclude bread, that is. I cannot remember a piece of bread being thrown away: stale bread would always be used somehow, eventually as bread crumbs if no other idea popped up. I can still se the huge brad crumbs jar in my grandparents cupboard as if I had it before my eyes. Most couples have their special song, movie or special place which bring back memories of that special time at the beginning of their relationship when every moment spent together was lived with joy, expectation and maybe a little fear. Daniela and me have our special place too –actually more than one, though a particular spot in Cambridge has a special meaning for us– but the one thing that brings bag that special feeling is a particular pasta dish that is forever bound with a particular moment in our relationship when mere flirting turned into something more serious. It is time (Lion King anyone?). After an almond based amuse and a meaty appetizer it is time to reveal my contribution to this month's SHF/IMBB Cookie swap event. With Sicily in my mind, I thought for a long time about baking some traditional sweet out of the region's classics and I would have had enough to choose from. 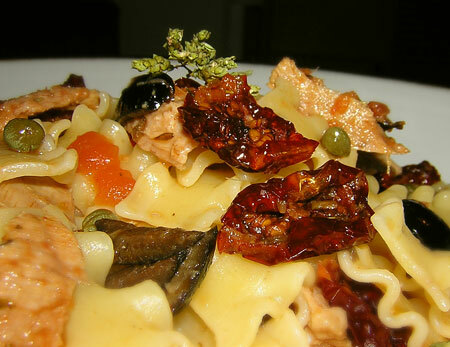 Instead I opted for a little creativity; having some Sicilian ingredients at hand, I felt like playing around a bit. The result is shown above. If you've red this blog from the beginning, those cookies might remind you of something else I had written about almost exactly two years ago (gosh, my photos were really ugly back then!). 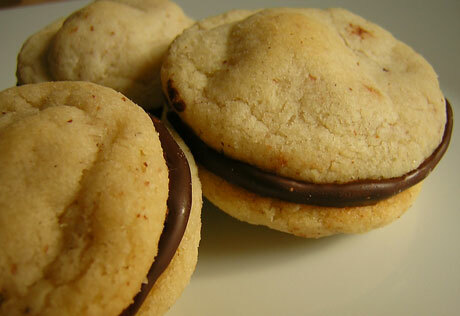 These cookies are indeed inspired by those Baci di dama I baked back then –and a few times more between then and now– yet with a twist that makes them more "Sicilian". Maybe not so much in acquiring an authentic Sicilain taste, rather inspired by the flavors and aromas of the island's pastries. I'm calling these Baci di picciotta for the time being, as a sort of pun: baci di dama means, lady's kisses, and "picciotta" is Sicilian dialect for girl. If you have a better suggestion I'm all ears. i was just really very hungry. The passionate cook. Tempting your tastebud every day.